Ford Mustang 2019 pays tribute to the original pony car with 26 eye-popping portraits of the classics up to today's all-new models, plus a free poster. 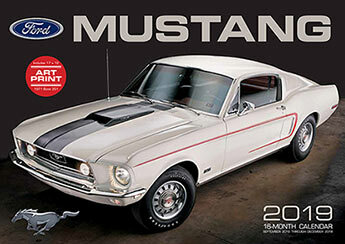 With over 50 years of production and some 10 million cars built, the Mustang is recognised and admired worldwide. Ford Mustang 2019 is a 16-month calendar which features vehicles from classics to today's all-new models as well as a frame-ready Mustang poster.